10 years ago, we bought our wedding rings at Sta Cruz, Ongpin Manila. Good thing my husband is so familiar with Manila, we didn’t have a hard time looking for a “good” and “trustworthy” shop. (Beware there are a lot of shops out there looking to fool shoppers) We knew exactly what we were looking for: a simple band made of yellow (Saudi) gold. This design is similar to my parents’ wedding rings. Hubby also liked the design. We found a shop which not only sold, but also made the jewelry. They assured us that we will be getting a ring that is made with 100% gold as compared to other shops that sell “gold rings” but are actually just gold plated and is actually just steel inside. They even went on to show us a cross section of a wedding ring they made to prove that it was all gold through and through. Our rings cost us 7,000 for the pair. We just loved it! Fast forward to the present, we haven’t been wearing our wedding rings for a while due to a few reasons. #1 through the years, our fingers have grown too fat… #2 most of our jewelry and watches are made of silver/white gold/steel. The yellow tint of our wedding rings didn’t blend well. To celebrate our anniversary, my husband and I decided to start wearing our rings again. What better way to celebrate our union as husband and wife than to start wearing the very thing that symbolized our marriage. We had to have our rings resized. Let me digress, we had 2 pairs of wedding rings. A few years before our church wedding, we already had our civil wedding and we had our simple (thin) gold bands from that wedding. Then, we also had the rings from our church wedding. 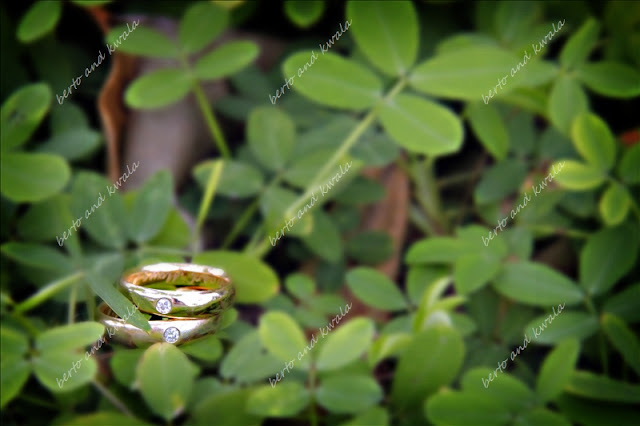 We decided that it really was no use keeping 2 sets of similar looking wedding rings. So we decided to combine the two rings into one, and as an afterthought, we also decided to add a solitary diamond on each ring to celebrate the past decade that we’ve been together. We found a wonderful jewelry shop in Shoppesville, Greenhills, Bernardo Jewelry(?). A woman was kind enough to assist us and even gave us discounts on top of the already reasonable price. It cost us another 12,000 to have all the adjustments made, since they had to add a few grams of their 24k gold. The result was just wonderful! Our rings looked new! All shiny and heavy and sparkly! On the day of our anniversary, we attended mass. After the mass, we were blessed by the priest, he also blessed our rings. He was amused that we still had our original rings and that they still seem new. Hehehe =) We placed our rings on each other’s fingers in front of the priest the way we did 10 years ago, with a whisper of hope and love from our lips and a promise of forever from our hearts.